On Tuesday at around 18:45 UTC, all Internet connections between Syria and the outside world were severed. It’s currently unclear if the outage is an accident, part of a short test (as the country has performed in the past), or a longer attempt to censor citizens. Umbrella Security Labs first reported that OpenDNS resolvers saw a significant drop in traffic from Syria. On closer inspection, the security firm discovered that the Middle Eastern country had largely disappeared from the Internet. 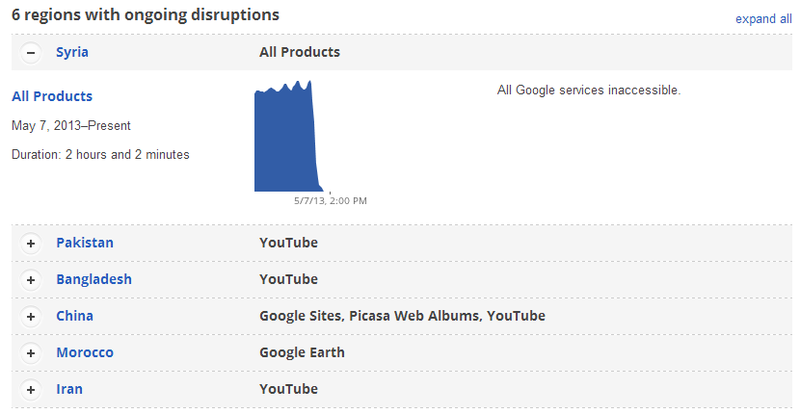 Google followed up with the news that all its services are inaccessible in the country. At around the same time, there’s an obvious drop in traffic, all the way down to zero. Page views served to #Syria via @cloudflare over a 15-minute period an hour ago: 6628. Page views served in the last 15 minutes: 3. Internet disconnections have been a tactic used by governments in Egypt and Libya before, and Syria’s government has been accused of cutting Internet and telephone connections to block opposition activist and rebel communications multiple times, including in June 2011, July 2012, and November 2012. In all cases, the Internet was eventually restored, though outages ranged from less than an hour to over two days.